The ninth annual FanDuel Legends Classic tips-off Friday night when Marquette takes on Belmont in Milwaukee at 9:00pm (ET). Marquette, along with NC State, No. 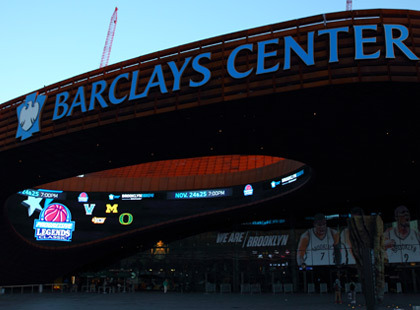 21/19 LSU, and Arizona State will host two games before traveling to Brooklyn to participate in the Championship Rounds, Nov. 23-24, at Barclays Center. At Barclays Center, the event begins with one of the most eagerly-anticipated match-ups of the season when LSU’s Ben Simmons, projected to be the top pick in the 2016 NBA Draft, squares off with Marquette’s Henry Ellenson in a battle of two of the top freshmen in the country. In the nightcap, NC State takes on Arizona State. Belmont, along with South Alabama and IUPUI, will play in Subregional Round action at Kennesaw State, Nov. 23-24. Tournament each of those seasons, becoming just the fourth coach in ACC history to do so…nine players, including three starters, are back, headlined by junior Cat Barber (12.1 ppg, 130 assists) and junior forward Abdul-Malik Abu (6.4 ppg, 4.8 rpg)…this is the Wolfpack’s second Legends Classic appearance (2011). Head coach Johnny Jones has won 61 games in three seasons at his alma mater, improving the Tigers’ win-loss record every season…this past year, LSU was 22-11 and earned an NCAA Tournament bid…three starters return, as well as 10 players from the 15-man roster…senior guard Keith Hornsby (13.4 ppg, 4.2 rpg) headlines the returning players…joining the roster will be one of the nation’s top-rated recruiting class, led by 6-10 National High School Player of the Year Ben Simmons, the No. 1 recruit in the country and projected top pick in the 2016 NBA Draft…LSU is playing in the Legends Classic for the first time. Marquette is under the direction of second-year head coach Steve Wojciechowski, who served on Mike Krzyzewski’s staff at Duke for 15 years after his playing career at Duke came to an end…back in 2015-16 are sophomore guard Duane Wilson (11.9 ppg, 68 assists) and junior center Luke Fischer (11.0 ppg, 4.8 rpg)…they will be joined by one of the best recruiting classes in school history, headlined by five-star recruit 6-10 Henry Ellenson (Rice Lake, Wis.)…Marquette is making its first appearance in the Legends Classic. After a successful two-year run at Buffalo, Bobby Hurley was hired to head the program at Arizona State…the former All-American at Duke led the Bulls to a two-year record of 42-20 and a trip to the NCAA Tournament in 2015…he inherits a team that was 18-16 with an NIT appearance…four starters and eight letterwinners are back…senior guard Gerry Blakes (11.1 ppg, 60 assists) and junior forward Savon Goodman (11.2 ppg, team-high 7.6 rpg) lead the group…this marks the Sun Devils’ first time playing in the Legends Classic…Brooklyn Nets’ head coach Lionel Hollins had his number honored at ASU. The Owls are under the direction of former National Coach of the Year and two-time Big East Coach of the Year Al Skinner…Skinner, who served as head coach at Boston College and Rhode Island, inherits a team which sees three starters return from the 2014-15 season, led by a pair of seniors…guard Yonel Brown led the Owls with a 15.2 ppg scoring average while also handing out a team-best 2.8 assists per game…forward Nigel Pruitt tallied 12.2 ppg. In his third season at South Alabama, head coach Matthew Graves now has a roster with which to work…only six players returned in 2014-15; this season three starters are back…second-team All-Sun Belt Conference selection Ken Williams led the Jaguars in scoring at 15.7 ppg and dished out 80 assists on the season…sophomore guard Taishaun Johnson netted 12.5 ppg and pulled down 4.1 rpg…senior guard Barrington Stevens led USA with 104 assists.